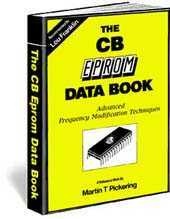 Eproms are often associated with modern microcomputer technology and thought to be equally as complex! However, far from making life complicated, Eproms are as easy to use as any other electronic component and can make simple work of an otherwise difficult circuit. Using simple language and a good selection of diagrams, this book explains how to make effective use of Eprom technology in modern CB radios. Increasing the frequency range by "pulse subtraction" using ordinary logic chips - a complete example with circuit and explanation is given. You can download a free copy.